One of the best reasons to start a home improvement project is to make the house more energy efficient. However, the world of energy-efficient products can be a little confusing. Studies suggest that upgrading your windows to more energy-efficient models is the best place to start. This is because homes lose a majority of their energy through windows. Read on to learn more about how do energy-efficient windows work. One way that energy-efficient windows save homeowners money is through the use of low-emissivity glass, which is referred to as low-E glass for short. The glass blocks out nearly 90 percent of the sun’s UV rays, so it prevents the inside of the house from heating up. This means that the homeowners will spend less money cooling the inside of their house. Typically, low-E glass is covered in a reflective coating or a tint to achieve this effect. Although most of the energy that homes lose happen through the glass of their windows, they also lose some energy through the window frames. 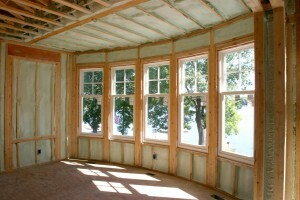 Many energy-efficient windows fill the frames with a polymer structural foam that lowers the U value of the windows. The U value is a measurement of the rate of heat loss. This means that windows with low U values are the most energy efficient. Traditional windows lose a majority of their energy via the glass because it’s not insulated. The glass in newer, energy-efficient windows is insulated with multiple glass panels in the frames. In between each layer of glass is a pocket of gas that not only blocks UV rays but also provides more insulation. In most cases, triple-pane windows block around 97 percent of UV rays from entering the house. This prevents energy loss and keeps the fabrics of curtains, furniture and carpet from the fading. While the upfront cost of installing energy-efficient windows might be off-putting to some homeowners, the money that they save on their energy bills over the long term is usually enough to make up for it. Homeowners can also feel better about themselves for doing their part to reduce carbon emissions. Just be sure that you have the energy-friendly windows installed professionally to avoid any air leaks. For more information about windows, contact USI online to find a branch near you to get a free quote. USI believes that excellence in every step of the process and ensures timely completion and quality of service, time after time.